A Modest Proposal To The Academy, Who Can’t Seem To Find An Oscars Host | Birth.Movies.Death. Earlier this morning, the Hollywood Reporter revealed something shocking: apparently, no one seems to want to host this year's Academy Awards ceremony. With only three months left until the 91st iteration of the event, producer Donna Gigliotti has repeatedly come up empty-handed in her attempts to find an MC, and no one seems quite sure who to blame: are the Oscars' slowly-dwindling ratings making the job less attractive? Is the "low six figures" paycheck simply not enough? Perhaps the gig is seen as a thankless one, given how ruthless the press has been in scoring the performances of past hosts. Whatever the case may be, the Academy has no idea what to do. But we do. Our modest proposal to the Academy: let Nathan Fielder host. "...the host is expected to boost the ratings, which means he or she must have wide name recognition; must be funny (without being tawdry), topical (without being controversial), politically savvy (without being too partisan), young (but not so young as to scare the Academy's governors) and satisfactory to a coalition of competing interests, including the Academy's president, its sprawling board and ABC — not to mention Donna Gigliotti, who was named to produce in October and who'll be joined by veteran director Glenn Weiss." Wide name recognition? Boom, done. 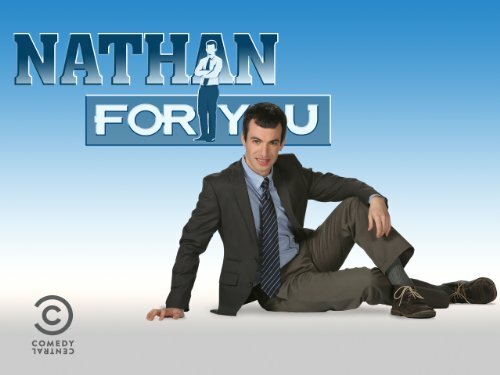 Nathan Fielder is insanely famous. This is the guy who made national news with the "Dumb Starbucks" episode of Nathan For You (a bit of performance art people are still talking about four years later), the guy who ripped the lid off the hacking scandal that sullied this past year's Emmy's ceremony. Funny? The man had his own show on Comedy Central. It ran for four seasons. You really think Comedy Central would have left an unfunny person on the air for four years? I certainly don't. As for being topical, Fielder's in the news even as we speak. Yesterday it was revealed that an Amazon Flex worker by the name of Jackie Crow had lost over 100 pounds simply by delivering packages for the universally-beloved online retailer, a strategy which was virtually identical to the one introduced in Nathan For You's classic season three episode, "The Movement". Nathan For You may have run its course at the end of last year, but the name of its star is still on everyone's lips. Can't get more topical than that! As for being young, politically savvy, and "satisfactory to a coalition of competing interests" - hell, that's Nathan Fielder all over. At just 35 years old, Nathan Fielder has accomplished more than virtually any member of the Academy, and he's done it without kowtowing to any particular side of the political divide. Fielder is a man of the people, a true working man's champion, as inoffensive as he is warm and lovable. Quite frankly, the suggestion that the Oscars might find someone more qualified than Fielder (particularly if these are the prerequisites the Academy's looking for) is insulting. Look, we don't want to tell the Academy how to do its job, and we certainly take no pleasure in hearing that Donna Gigliotti is having trouble finding a host for what is undoubtedly the most important, elegant, and relevant event of the year. But we do know that if Nathan Fielder gets hired to host the Oscars, it would solve everyone involved's problems immediately, and would surely result in the most memorable Oscars telecast of all time. Or I guess they could just drag Billy Crystal out of storage again. You tell me which seems like the better option.